Conspiracy Or Coincidence? 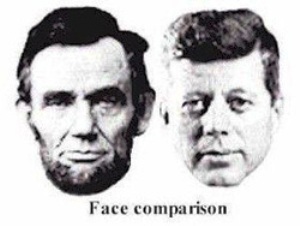 Lincoln And Kennedy. It is often said that if one does not learn from history, they are doomed to repeat it. So what does it mean when history isn’t exactly repeated, it’s just full of crazy coincidences? Have a history teacher explain this – if they can. Memorial Day is a United States Federal holiday observed on the last Monday of May (in 2008 on May 26). Formerly known as Decoration Day, it commemorates U.S. men and women who perished while in military service to their country. First enacted to honor Union soldiers of the American Civil War, it was expanded after World War I to include American casualties of any war or military action. previous post: Kanye West Ventures Into The World Of Travel. next post: George Clooney Is Single Again! So Is Sarah Larson. Hey, it might be lame, but it’s still trippy. And it’s a good way to pass some time. I have never said that everything on my blog is 100% true. It’s just something fun to do. Thanks for the link. Until your sarcastic comment, I had no idea there was a snopes.com link. Why don’t YOU pick two events and find the coinsedences in them? Might be fun to share with others. As for coinsidences, I don’t (personally) believe in them. Doesn’t necessarity mean it’s either true or not, but there IS something to it. Perhaps that’s where FATE steps in. 53 queries in 0.701 seconds.